(i) 10th pass with 45% marks. (ii) There is no requirement of percentage if the applicant has higher qualification i.e. 10+2 and above. (iii) Those applicants who have passed 10th in Grade System should have minimum D grade. Should have age in between 17 ½ years to 21 Years. (i) Applicants who have passed in their 12th class examination with 60% marks can apply. (ii) Even if an applicant is a graduate or has a higher qualification, percentage marks scored would not be applicable towards his eligibility. Qualified applicants of district Shimla, Sirmaur, Solan and Kinnaur Districts of Himachal Pradesh can apply. Candidates can apply online without paying application fee. 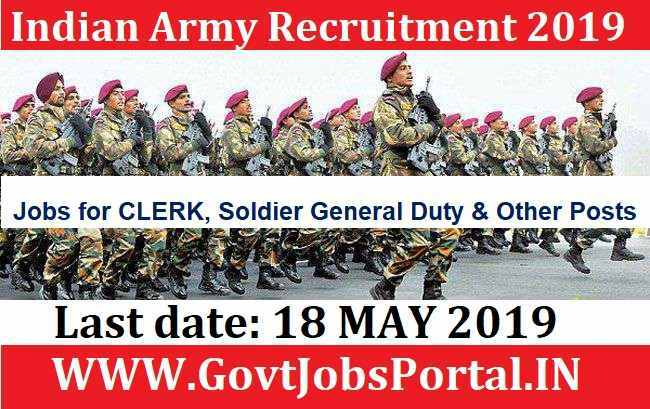 Indian Army is inviting all candidates to apply for FREE. 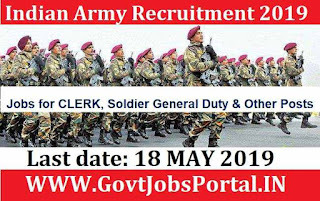 Process for Applying: Qualified applicants have to apply online at the Indian Army’s website (http://www.joinindianarmy.nic.in/) from 04 April 2019 to 18 May 2019. There is no other process for applying this Indian Army recruitment process 2019. Selection Procedure: Selection will be based on the basis of Physical Fitness/ Medical Test/ and the Written Test.